This section of the Virtual Mountains website is dedicated to the mountains of the British Isles, saddly limited at this time to England, Scotland and Wales, though with good fortune expanding to include Ireland. The Nuttalls : A list of peaks and tops over 2000ft (610m) with at least 50ft (15m) distinction, first compiled by John and Anne Nuttall, and presented over two volumes in "The Mountains of England and Wales" published by Cicerone. The Welsh 3000's : Already by definition included in the list of Nuttalls. The Historic County Tops : Particularly those in the more remote countryside. The Munros : A list of peaks over 3000ft (910m) first compiled by Sir Hugh Munro. 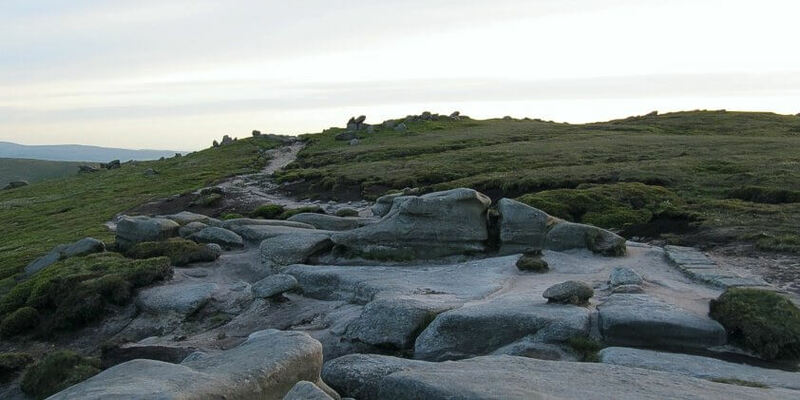 The Kinder Plateau in the Peak District. Any mention of a product, service, or route is not an endorsement. Things change, uneconomic services are cancelled and new service introduced. Mountain huts are often only open in season, can be closed due to weather damage, or may have been removed altogether. To help you get up to date information I have placed links to third party sites..